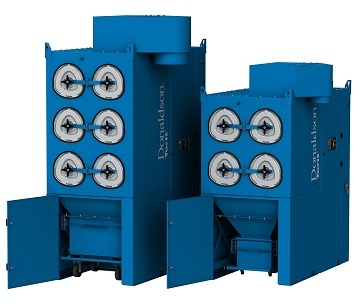 Donaldson Company Inc. introduces the Packaged Downflo Evolution (DFEP) dust collector, a complete system for collecting industrial dust and fumes. The system includes a Downflo Evolution dust collector from Donaldson Torit, preassembled and shipped with integrated electrical controls, motors, and fans for easy installation and operation. The DFEP leverages the features of the Downflo Evolution cartridge technology – pulse-jet cleaning, airflow management, and filtration efficiency – and bundles them into a turnkey system.